A special wish to my own daddy though!! He is still one of my favorite men in the world. Growing up he worked hard, sometimes two jobs, in order to provide for my family and so my mom could stay home and homeschool me and my two brothers. Although he worked a lot, he knew that quality time meant far more than the quantity of time! We went on many camping trips, had baseball games in the yard, built tree houses, went fishing, played board games, and just had fun together. I was raised in a very religious home in which God was at the forefront of our lives. My father led our family in prayers, bible readings, and just discussions about how we could live our lives to honor God. Not only did he talk the talk though, he totally walked the walk too! I am very proud of my father and very proud to be his daughter...I love you daddy! Not only do I get to wish my dad a Happy Father's Day I also get to wish it to my own wonderful husband who is the world's bestest daddy...just ask Dylan or Zoe!! I didn't think I could love my husband any more than when we first got married, but watching him hold Dylan and Zoe the day they were born and then watching him be daddy, makes me fall even more in love with him. He is always ready for anything and even after a long day of work will head outside to push a swing, kick a ball, read a book, or just listen to a story about the day. I love to watch the kids run to him when he gets home and then watch as he gives out hugs and kisses and tells them how much he missed them that day. Our family is as great as it is because of our fearless leader...I love you, babe!!! 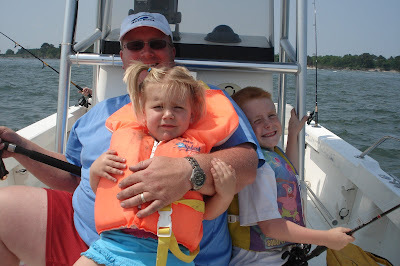 *This was taken today on our Father's Day boat ride! Happy Father's Day also, to my father in law, Tut. Without him I wouldn't be able to celebrate this day with my own family. He (with some help from my mother-in-law Sally of course) did a wonderful job raising Dave and I appreciate all of their hard work because he is one special man! !